Potted review: The Expendables is OK but a bit of a missed opportunity – was Stalone been eating Quiche while writing? I went to see The Expendables last night. I had worried that the Arnie, Bruce Willis and Stalone scene was going to turn out to be flan; that the whole of it might have been used for the trailers. Fortunately it hadn’t been so it was a fan pleasing moment. It wasn’t Robert De Niro and Al Pacino in Heat but it was three of the biggest box office stars of the 80s on screen together. However it set up a pattern for the rest of the film. Stalone has a scene with Statham. Stalone has a scene with Rourke. Stalone has a scene with Li. It would have been nice to see Statham with Li or Li with Rourke. Despite all the screen time he had Stalone’s character felt like the least well developed. His motivation for going back badly drawn pretty much coming down to a facial tick when he first sees Sandra. Now I’m not saying that any ‘80s action film needed more than that but this film wasn’t a true ‘80s action flick. It felt like someone was eating quiche while writing it. It kept trying to be something a bit more modern. The dialogue in all those scenes between Stalone and an other actor was subpar Tarantino. The inclusion of, the sadly underused, Charisma Carpenter just reminded me how Joss Whedon turned the heroine needing the male action star coming to her rescue cliché on its head. The action sequences at least were very much in the ‘80s action style. There wasn’t a lot of obvious CG or a reliance on slow mo / fast mo to try and make the action more exciting. There were car chases, fights, explosions, big guns and all the other elements you’d expect. Sadly the final big fight had one element I’d hoped would be avoided – confusion. As it progressed it just wasn’t clear who was doing what or who was fighting who. At one point I thought Stalone was in a fight and then realised it was Statham. More shots of them working as a well practiced unit like they did in the opening boat sequence could have raised the saved the finale. It wasn’t Street Fighter confused but it lost narrative in favour of things going bang. It also felt at times like it was trying to set up a franchise rather than do what it should have. Jet Li’s whole family thing needed to be developed and explained rather than be left hanging. Dolph Lundgren’s miraculous return from a “fatal” wound now in therapy / treatment for the ride into the sunset. Is Stalone hoping he’s set up a new action franchise that he can pick and choose from a cast of action stars for? 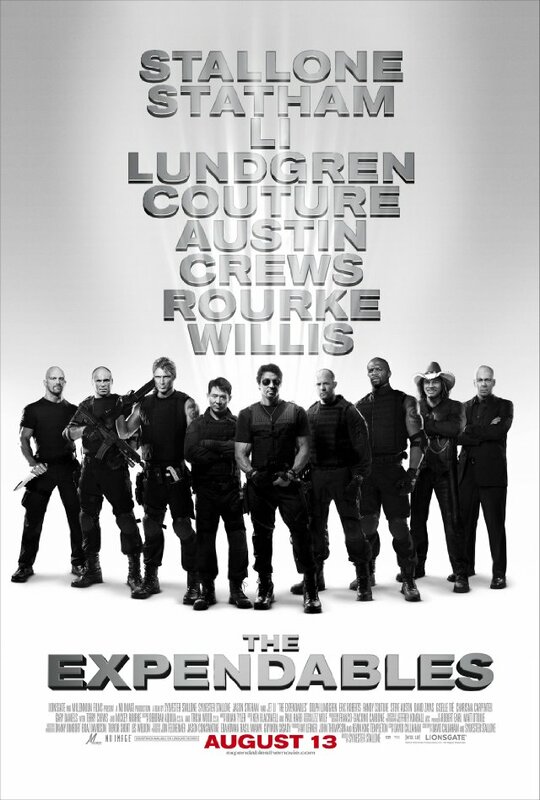 So overall I’d come away saying The Expendables was another so-so action film. It’s on a par with The A-Team, The Losers or Salt each of which had flaws but, for me, Inception is still leading the pack with Solomon Kane getting an honourable mention for trying to be different. There is at least one challenger left for the 2010 action crown – the trailers for R.E.D. look good. Can Bruce and friends teach the youngsters a lesson? THE BEST FILM EVER. CoooooooooooooooooooooooooOoool There's so much blood.